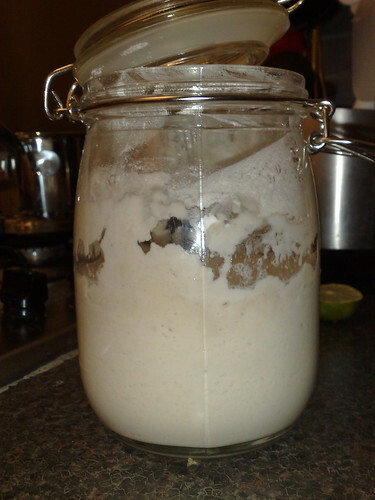 I’ve had my sourdough starter sitting on the side in the kitchen for over a week, feeding it regularly, and using some of the discards to make half sourdough, half yeast risen bread. Looking closely enough, you can see bubbles in the mix from the inside of the jar – but it’s nowhere near as lively as this starter picture. 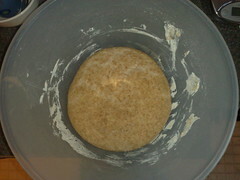 So I was a little uneasy that it wasn’t ready to make a wholly sourdough risen loaf. It’s still pretty cold in the kitchen, and that might account for the low activity in the starter. 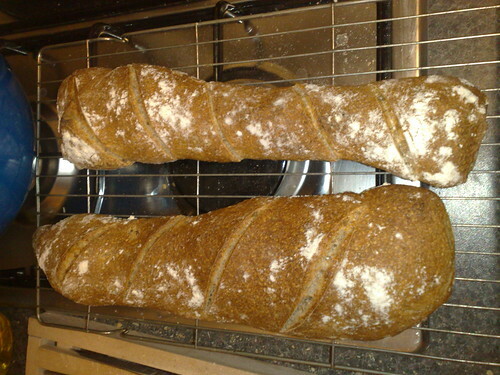 Still I tried anyway – and left the rising dough sitting on the boiler overnight. 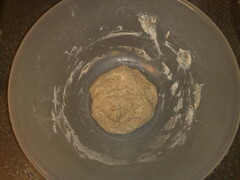 Which seems to have more or less risen to double the size of the original dough, which was the criteria for continuing. But leaving it on the boiler also ever so slightly cooked it. The dough was crusty on top. I had been watching these series of videos from FoodWishes – in particular the last one. I was very impressed that the guy there seems to be using the same ingredients as me, but with vastly better technique and better proving got the most enormous loaf out of the same mix. Anyhoo, these are the loaves that resulted. This entry was posted in Food and tagged sourdough. think you need to leave (possibly damp) clean cloth over proving bowl to stop dough drying out..?? Mmm, yeah, I did – but it’s a big bowl and the teatowel was a long way off the dough. I think perhaps I should oil the dough too.